Listen, this promises to be a rather long read, but I promise you it is worth every word. Delve in. Last week I spent an important afternoon at Safaricom Headquarters’ with one Diana Ogeto. I say important because as a Safaricom subscriber, I demand good network and for Diana who is an Access Support Engineer, it falls on her shoulders to ensure that I, among millions of other customers are not only satisfied with network coverage, but also delighted. As an Access Support Engineer, Diana Ogeto is the first point of the network access for all the customers. Wherever there are reports of network failure or faults, she comes in as the point first point of contact to resolve it. By taking stats daily and ensuring that every site that Safaricom has is working, and if it is not working, finding out and fixing what can be done about the fault. Her work cuts through all the 3 network technologies throughout the country. That is 2G, 3G and 4G. She ensures that any necessary changes that need to be carried out to improve the network are carried out as near seamlessly as possible, at nearly unnoticeable hours of between midnight and 4am. When I asked her why Technology, Diana did not even know where to begin. Not for lack of expertise of course but because Technology is everything. It is so wide and so useful in our every day lives that sometimes we do not even notice. When we wake up and are able to access our apps of choice for example, pay for shopping, keep track of our fitness through wearables, and pay parking through our phones while eliminating cash middlemen like the city council, all this is tech. I think about it and find myself placing my own life right in the middle of the benefits of tech. A lot of my family lives abroad, including my mother, sisters and little nieces and nephews, and yet I’m able to keep up with their growth and well-being right from here Nairobi or from the village. I’ve often said that I work from the village a lot and yet I’m able to access my data, emails, documents and videos without a hitch. I’m able to send my mother photos of general developments in her farm and that gives her priceless peace of mind. I’m able to experience the growth of my nieces and talk to them almost on a daily basis and so when they come here, we do not do any awkward stranger to stranger introductions. When I’m home, I’m able to call my mum and her peers can talk to her on video. My family aside, throw in things like Dropbox, cloud services and social media and the magnitude of Technology is clear. Let’s not even talk about artificial intelligence like good old Sophia for example – and the outlook on the amount of additional Technology that is about to inevitably hit us through continuous innovation in Kenya in terms of robotics and you get the picture. Tech is the now, tech is the future. Kenya, and especially companies like Safaricom have never shied away from innovative Tech and we’re automating a lot of things and making our lives easier. At the pace with which we’re moving, in the next 10 years we’re looking at huge developments and Diana would like to be in the middle of it when it happens. How has a career in Technology impacted Diana’s life? Other than being her bread and butter, Technology has opened her eyes to the real-life challenges that people are facing. It has given her the satisfaction of being behind that very important, sometimes even life-saving phone call to call an ambulance, or M-pesa transaction. Medical Technology has saved lives through superior imaging and life support machines. It has also offloaded so much from our banking sector and given people time to pursue other things. Those of us who remember bank queues snaking round buildings will identify with this. Once again I found myself in the middle of the benefits of tech. Having gone to Diana’s place of work 2 hours before time, I did not have to sit and seethe at reception. I was tethered and working the whole time and did not notice the time whizz by. Technology has opened Diana’s eyes to lots of networks with power women she would never have met before, shaped her future career aspects, and showed her that there is still so much to be done and that she’s in a position to be part of it all. For example, she participated in iamtheCODE last year, whereby they picked young girls from the ages of 12 and 17 from disadvantaged communities in Samburu, Turkana, Lodwar and Kibera and helped them create bits of code and basic apps that actually work. There is no greater satisfaction than seeing a smile on a girl’s face when she’s able to develop that small code and have it work to enhance something or solve a problem in the society that they come from. To help the girls see big possibilities and peer through the small cocoons that are their disadvantaged communities and societal norms and expectations. Remember we’re talking about girls who have never seen laptops or computers. It is not far-fetched to say that this goes further to ripple into reduction of retrogressive cultures like FGM and early marriages. It is these girls who will make it out and go back and help others with time. This is what I call the power of opportunity and it touches me to the core. It is what gives me the impetus to write about other Safaricom projects like Ghetto Classics and further afield, Equity Bank’s Wings to Fly. 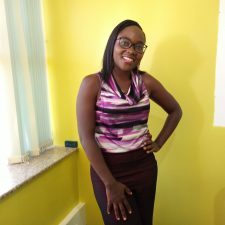 Through Safaricom’s Women In Technology, Diana has also been able to participate in Safaricom’s KidsGoTech – an initiative that invites kids aged 5-12 years to Safaricom offices during school holidays to develop small bits of code that once again work. These codes may not work to move the world at that stage, but they do plant a crucial seed in these childrens’ minds. And the Women In Tech do not stop at that. They also have an outreach program whereby they visit these kids when they move further to high school and even campus, see how they’re doing and encourage them further. They even go further and arrange career fairs and enable girls to meet sponsors and prospective employers and this rises their hopes and prospects even further. Once the children and teachers see women engineers, they’re able to realize that sciences and technology are not meant for boys only. Despite what has been programmed into them by society, girls can, and do excel in these fields too. The Women In Tech program allows campus and college students who pursue Technology to visit the company and sit with them to get a feel of how Safaricom runs, and later allows them to intern there for 3 months through the inhouse Technology Academy where they work at under guidance, mentorship and supervision. Clearly Diana could sit pretty and do just only what is required of her and actually get away with it, but that’s not the case. But as a woman in Tech, she acknowledges that she has been inspired by great women before her and wants to pay it forward and inspire young girls to drop the shackles of societal perception that prevent them from getting into technology. She voluntarily wants to be a STEM ambassador. What are the significant moments that have impacted Diana’s life as a woman in Technology? By now you know that Diana’s career as a woman in Tech at Safaricom has been out of this world but things do not end there. Just to name a few, she was at Safaricom when 4G was coming up and she was part of the team that oversaw the company’s sliding into that Technology. The eureka moments that blew their minds as they looked at the terabytes that flew through their screens as people were able to access super-fast data transfer. Another significant moment for her was when Safaricom was modernizing the network from very old equipment that would be affected even by rain. Other than these, there is also the moving M-Pesa servers home, and Fuliza also come quickly to mind. These are some few huge defining moments that make her glad to have been part of the actualization team. What is the role that women have played in developing technology over time? Once again where to begin! Diana chose to begin from women geniuses like early age Ada Lovelace who is said to be the first computer programmer (developed the world’s first analytical engine), and mathematician and code breaker Joan Clarke. These women engineered technology as we know it in present day where we have Sheryl Sandberg – the COO of Facebook and author of Lean In. She has special mentions for Ginni Romertty – the president CEO of IBM, and Radia Perlman who was very instrumental in the development of the world wide web that has just about condensed the entire world into a small village. What is stopping more women from being in technology? Social perception. It is innately ingrained in our minds right from the age of Aristotle that women are more of emotional than rational, and through this, men have been able to make their case that they deserve to be more in the technical industry. But being emotional simply means that women are more sensitive and attentive to the needs of the customer. Women see the process and the details while men see the end. Unfortunately, this huge advantage that women have has been turned around to deny them a seat in Technology while giving men an upper hand over decades. Some societies still believe that it is more beneficial to educate a man than a woman, and the girls are sent off to do less impactful college courses, or worse still married off at early ages. In the corporate world, throw in factors like maternity leaves and long standing self limiting beliefs and the picture as to why women are behind in technology is clear. Yet this does not have to be the case. We still have some companies that have unpaid maternity leaves and by the time women come back to work, they’re light years behind their male counterparts. This further pushes them down the Technology ladder. Admittedly, and considering that I’m not exactly below 26, when I think about BLAZE I think about talent shows, dancing and Be Your Own Boss. About 14 to 25 year olds just dancing about and fumbling about earlier life. But as I have since come to learn from Diana, there is BLAZE Young Scientists of Kenya, a unique platform in Kenya and East Africa that allows young people to demonstrate their strengths in sciences and mathematics with the aim of transforming their lives through innovations of Science, technology, engineering and mathematics (STEM). BLAZE by Safaricom and other partners is making STEM accessible to girls and other learners in secondary schools through national exhibitions and is now in its second year. The company has so far given 20M shillings and in cash, and in kind, it has donated over 25M towards development of Technology in young people. BLAZE by Safaricom has for the second year taken up platinum sponsorship for Young Scientists of Kenya. The end game is to reach all the 47 counties and preach the goal of STEM, and not just to those who make it to campus but also other colleges. How can achieving women be an example to young girls? Through mentorship and leading by example. And if my judgement of Diana’s persona is anything to go by, just being kind and approachable to start with. Diana participates actively as an alumni of her high school for example. She goes for every annual alumni association to show those still there that just like her, they can excel in Technology. Telling her story plays a very crucial role in shaping the minds of young girls. When the students see that that the school sprouted a successful woman in Technology, they know they can make it, and carry the mantle. Other than that, she picks a girl, mentors her and walks with her. By the very act of the girl having someone they’re answerable to, future Technology stars are born and nurtured. Also through follow ups – through the 47-47 outreach they follow up on these kids to find out their challenges and how they can make things easier for them, as well as what they can do to assist their teachers. There’s a program whereby Safaricom deploys computer labs especially to remote areas where kids have never seen them. Students are able to access them for a start, and because teachers are also put in the know, they’re able to follow up. Statistics show that girls actually outperform boys in STEM courses. Mathematics and science, not just languages and arts. Who knew! Girls are doing a good job. Her message to the girls is that they’re doing a good job, to keep at it and they’ll excel and change the world. After all when you educate a woman you educate a community. With these efforts, in the next few years there’ll be a clear shift in gender balance in Technology. What are the projections for women in tech in the country? In Safaricom alone the projection is a 50/50 ratio by the year 2030. In Technology the company has improved greatly from 7% to 22% in Tech in just 6 years. Thumbs up. Diana is hoping for a shift in the next few years where women will break the glass ceiling, and girls will be able to take the mantle that has been passed to them and run with it.